The bodies of two University of Buea students, who were killed by police bullets during last week protests, were over the weekend, secretly taken out of the Buea hospital mortuary to the Northwest Province for burial. 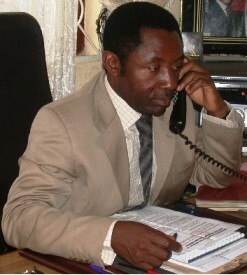 Buea Council Mayor, Charles Mbella Moki, who reportedly played a big role in the nocturnal mortuary ceremony later attracted criticisms from various quarters, according to reports. Reacting to these criticisms, Mbella Moki said it was because "the circumstances were also peculiar." He said he also had to assist in arrangements to bring in Dr. Herbert Endeley's remains, like he has done on several other cases. He said in the case of the slain students, their families came to him for assistance. "The families of Ivo Ufeanei and Bennet Moma came to me requesting assistance to give their children a befitting burial," said the Mayor. Mbella Moki said he agreed to assist them but that after they left, he started receiving calls and criticisms from various individual quarters, which made him withdraw from the commitment. The next day, Mbella Moki said, both families came back weeping, that the way the administration was taking the matter indicated a likelihood of the latter resorting to burying their children like animals. "I also called on a doctor to conduct the necessary and complete medical examination and the State Prosecutor to do the investigation thoroughly. It is after all of these formalities were completed that the assistance was handed to them. I have all the documents the families signed in my office," the Mayor stated. Mbella Moki said when he asked the families to contact the University authorities and the students' colleagues, they said they didn't want any publicity about the funerals because it could have ignited a situation similar to that of last year when, during the removal of corpses, there was a riot. He said they didn't want any more people to be hurt. "I merely performed my duties as Mayor to see that the dead got a befitting burial," Mbella said. He said he physically assisted the families from removal of the corpses through their conveyance to their final resting places. Asked about the other people who were wounded, the Mayor said he was called by Dr. Ndeh of Solidarity Clinic on the case of the hairdresser, Laura Ambang Abieanga, who was shot in the neck. "Doctor Ndeh told me that he hadn't the necessary facilities to save the girl's life. I braved all the teargas and bullets to come to the succour of the lady," Mbella said. He said he was picking the hospital bills of those injured and are lying in various hospitals in town. He said Council staff, under his instruction, have always been present at the hospitals to know the conditions of the wounded. "We cannot wait for them to die then we start bringing assistance," the Mayor averred. The two students who lost their lives were Ivo Ufeanei, 22, and Moma Bennet, 21. Clearance Nkemtah, a second year Banking and Finance student took a bullet on the leg. Terence Ngundam Nde who was shot in the stomach is a second year Economics student, while Moma Rudrick, is a Chemistry student. Many others who stay or work around the Molyko neighbourhood either suffered from grenade blasts, teargas and or police torture. One of the victims, Nkemtah, whom The Post talked to from his hospital bed, said they were fleeing when the bullet caught him on the leg. Laura Ambang said that she just closed her saloon and was going home when she was shot in the neck. It should be recalled that the Mayor played a vital role in re-instating peace when UB students went on strike last year. The gruesome murder and torture of fellow Southern Cameroonian(SC) students commenced on Monday, the 27th November,2006. This was due to the following political scandal from the occupied master: La republic du cameroun(LRC) on our fellow citizens. 1. The government created medical schools in Douala(LRC) and Buea(SC). Entrance examinations were written in all the above centres. 2.Only two SCs were selected eventhough many SCs passed the entrance, while the rest were from LRC, in Douala. The setting of this examination in the various centres was based on the language used. That is English in SC and French in LRC. 3.Of the 800 students who sat on the entrance examination into the medical school in Buea University, only 127 passed, all hailing from Southern Cameroons. The first la republique du camerounian student took the 600th position. It should be noted that the exam in Buea was set by the Cameroon General Certificate of Education (G.C.E) Board marked using the computerise system, since they were structural questions. 4.The list of successful candidates was handed over to the Vice Chancellor(V.C) for endorsement and later published. 5.After the V.C approval, all successful candidates were happy and awaing for orals since only 60 students were needed. Unfortunately, the Minister of Higher Education rejected the list on grounds that the list suppose to be sent to him for approval. It should also be noted that the Minister did not reject the list from Douala for the same exam. 6.Thereafter, a document was faxed to the V.C's office from the Minister to include 26 names, all being students from la republique especially the President's tribe(Eton,Beti & Ewondo), who did not sit in for the said examination. of Southern Cameroonian students will be 34 out of 60. 8. The students for the collective interest of their colleagues who succeeded, asked the V.C to tell the Minister to annul the illegal list, but to no avail. 9.Then the students called in for a peaceful strike, that is, domonstrating their grievances on the school campus. They started shouting: No to corrupt!, No to bribery! They wrote placards carrying messages such as: Anglosaxon Universities are not corrupt; Yaounde should not corrupt our University and a lot of others. 10. This move was to shun corruption in univesities and allow meritocracy to prevail. 11. President Paul Biya , a colonial master of Southern Cameroons sent his secret agents en civile to monitor the gravity of the strike and give him feedback. This act was to disrupt any move for the strike. 12. The students were on campus from the 27-28 but later forced out of campus when the Pro-Chancellor, Prof. Agbor Tabi told them that they should go to hell or to any organisation(s) and report. That they(students) can not change the system that has been put in place. He told them that he would call his guys(police) to disperse them. 13. The Honourable Governor of the South West Province, Eyaya Zanga Louis,from the President's clan(Beti,Ewondo,& Eton) said this was a positive corruption because the students(from LRC) would have jobs at the end of the programme. 14. On the night of 29th November, 2006, two(2) students were shot dead while the following day another student accompanied others to paradise, making three deaths. An old mother of above 70years was murdered by a stray bullet. A taxi driver who took a hairdresser to the hospital was also killed by a policeman. a) Hilary Muebe( was shot at the head) from the department of Economics. b) Ivo Obia Ngemba( shot at the mouth) from the same department. c) Ngundam Terence Ndeh( shot on the stomarch)was reportedly dead after a day. hairdresser) was shot at the neck in her saloon and Clerence Nkentah(student) whose stomarch was scraped by a bullet are currently receiving treatment assisted by Lord Mayor of Buea, at the Provincial Hospital Annex. Other victims of this raid were found in nearby clinics receiving treatment. The mayor in the cause of carrying a corpse to the mortuary was shot thrice but escaped with the corpse to the hospital. 17.Many people who were not students were molested and properties looted as the case in the bus park at 17 mile,Molyko and Bomaka(a nearby village from Buea). francophone students called their children home and none of them participated in the strike. 19. The soldiers of la republique du cameroun were rejoicing and singing" On a gagner!!! "meaning "we have won" after majority of the students flee for safety. They also said "les prisonniers, entrez dans la maison" meaning prisoners go to your home.The soldierswere using live bullet, explosives and tear gas. They were beating everybody in the quaters. 20. After fierce confrontation between the police and students whose weapon were stones, the executive of the Southern Cameroons National Council(SCNC) called a security officer whose name is withheld, that the strike was no longer the students affair but between anglophone and froncophones. That whenever there was a strike, la republique use live bullet on us but in their territory none of that was used. That we have called all Southern Cameroonians to fight against injustices and gruesome murder of our citizens. That we were ready to face any odds to remove oppressors from our land. 21. The Yaounde regime was immediately informed and within an hour soldiers who were sent from Douala and Yaounde were retreating to their various destinations. Even the sample guinea pigs for experiment were kept at bay from Ngoh for their own safety. Our revered Professor Ngu A. had also assigned us to also remove one of Ngoh’s testicles in a bid to curb his high level of testerone…. The operation was successfully concluded as Ngoh was emancipated of his tonsillitis. They were concerned about the fate of their friend…. As I raised my left hand to wipe away this menace with my shirtsleeve, Limunga seem to jolt out of her reverie just then and she spilled the whole tray of cutlery onto poor Ngoh. Since Tribalism is a speechless phenomenon it is easy to wave it arbitrarilly on the center stage of our national shame and disappointments. Mr. Amadou Ali pushes it further by calling these students 'instrumentalized vandals.' Only people blinded by the shallowness of the passing pleasure of the abuse of official powers could fail so woefully in reading the signs of time in the recent events. The student action in Buea is a statement by a new generation of Cameroonians that are tired of being pushed around by and to the whims to arm-chair administrators and mediocre leaders. That it happens in the Best University that we currently have in the country is a significant premonition of bigger acts of courage and bravery by the present generation that have learnt to know and love the taste of excellence. They have also learnt to shake off the mediocrity that has striven for years in Cameroon propagated by the abuse of official powers by the same group of leaders for more than two decades. Our Students have learnt that a mediocre generation of leaders, like those that we have now, is a lost generation because they fail to follow the bravery of their fathers and their children will not follow them down the path of shame. Our ministers may say all they want; after all they are of the lost generation, reduced to the footnote of the countless volumes of History that will recount the bravery of young Cameroonians today. We all have to make decide where we belong: on the crisp pages of the glory of a new Cameroon with the martyrs of Buea or in the footnotes of shame . The choice is now, Mr Minister! So the evidence is gone;or maybe not all of it.I'm offering the same amount to The Post to delete the pictures also,so we could calmly and confidently declare"ZERO MORT"! Mr VC of Buea University you have to stand your grounds. If the Douala list was never tampered with by the minister, then the Buea list has to be as it was released. It is high time we stand for a legacy and justice and not just for our jobs. Anglophone parliamentarians you have to make sure a commission of enquiry is set up to investigate the happenings in UB. Even if nothing is done, you can make the world to know what is happening. Mr PM did not say the list from Douala should have anglophones so as to represent the nature of our country so why say this in the case of UB. You are all sellouts and the day of reckoning is coming when justice shall reign. May the souls of the departed students rest in peace!!! I would like to get in touch with you for some inquiry. Could you contact me at njungwe@picam.org (www.picam.org). UB STUDENT LEADER ESCAPED DEATH FROM THE POLICE AS THEY SHOT RANDOMLY AROUND THE ROOM AND THE CEILING WHERE HE WAS. OTHER MEMBERS OF STUDENT UNION ARRESYED AND MAYBE TAKEN TO THEIR MAXIMUM PRISON KONDENGE. I will be contacting u soon. The VC has flopped like all power hungry boot lickers of his ilk.He should have stood his ground and at least have an honourable exit. That aside it is not surprising that in present day Cameroon, 21st century, students are shot dead because they call for justice and fair play in a Medical School to which this very students contributed money from their meager allowances to make functional. The question that really bugs my mind as i listen to supposed intellectuals like Ngoh ranting about Regiional Balance is whether this is the first professional school in Cameroon,or whether regional balance comes into play only when it concerns Buea. Go to CUSS, ENAM, National Police College Yaounde/Mutengene, ENAP Buea, or any of your choice and from your own analysis tell me if any notion of this purported regional balance was considered in admiting Cameroonians to their campuses.tell me whether at least 90-95% of students in these schools are not french speaking.Or look at the Public Service and tell me if we really know what we mean when we talk of regional balance. Again when we boldly go to the air to talk of regions in Cameroon, which regions are we refering to.I thought Cameroon was one and indivisible. Have some began to accept the idea of English and French Cameroon because they want to dubiously send their unworthy offsprings to UB. Cameroon will change, soon, but this may only be when we became capable of respecting those who fall in the line of battle. Shame on thos e who spend time weeping rather over broken cars. Buea today has been transformed into a milatory barracks as the so cals orals for the Minsiters list is supposingly programmed for this afternoon. In the meeting of Monday, Lambi said that Minsters list is non negotiable and that the program drawn up by the minister must be respected. School resuming on Thursday, Convocation postponed from the 16th and reiterated that the confussion is his error. Why then is this puppet not resigniong? He said text must be respected and the text of creation of UB spell out clearly that from the HODs to the VC, the posts must be elected. How elected this munster if he wants to respect the text? I will see how this story of soldiers more numerous in the school cqmpus thqn students will end. "If he resigned, they would have immidiately opened an investigation about the case of the two lecture halls which were completed and inaugourated on paper"
This suggests that Lambi has been involved in these racketeering like all La Republiques agent to steal our resources. That is why he has organised the slautering of four of our brothers and sisters and an additional eleven who died while fleeing the violence by La Republique's colonialist for Yaounde. Lambi and co, there is blood in your hand. Any lists from GUNPOINT MEDICAL SCHOOL, MOLYKO should be pasted here for analysis. All those CPDM stooges and bootlickers like Lambi and Agbor Tabi are frusttrated CPDM sideliners who will prefare to replace names of their own brothers in preference for those of the Frogs.They have sold ther conscience and without fear of ethnic profiling nor respect of their place of origin they blindly forget that these political positions they have will not last for ever.They never care about their own brothers. Look at Lambi openly declaring that; ....it was his fault to have signed the list' This is really a betrayal and irresponsibility which has caused more harm than good to his credibility and respect amongst the students and community alike.He has eaten the communion from Yaounde and has been instructed to answer YES from orders from above.They are more of puppet heads than school leaders without any personal decision. Attempts by authorities of the University of Buea to broker a deal with leaders of the University of Buea Students ’ Union , UBSU in order to arrest the ongoing crisis rocking the institution has hit the rocks. The leaders have refused to sign a deal which the University authorities dubbed “Packaged Deal” and have called for an unconditional release of their detained leaders. Yesterday Tuesday 5 December 2006 Dr. George Nyamdi who led a special committee created by the institution went out to the hideout of the students and convinced them to attend the meeting which was aimed at finding a solution to the imbroglio. After hesitating at the entrance to the campus after they saw truck loads of forces of law and order driven into the campus, the student leaders, however, finally went in with a lot of mixed feelings. The crisis meeting took place at the conference room of the Vice Chancellor of the University, Professor Cornelius Lambi. It was attended by the Vice Chancellor and his Deputies, Registrar, Deans of Faculties, Heads of departments and other administrative top brass of the institution. Also in attendance were University Chaplains from the Presbyterian and Roman Catholic churches and the Regional Secretary for Human Rights and freedoms, Tambe Tiku. The student leaders also insisted that the press must be in attendance. The issue at stake was to see how negotiations carried out for classes to resume on Thursday and for the effective running of the orals on Wednesday. The “Packaged Deal” presented by the spokesman of the special committee, Dr. George Nyamdi had as points; the effective resumption of classes on Thursday, creation of a follow-up committee to implement the Packaged Deal, the organization of orals into the school of medicine, release of all students detained between Wednesday and Friday. After concerting with the student leaders taken multi leaves from the hall, and from unending pressure on them, the UBSU leaders were about to sign the deal when their spokesman Donatus Wanobi got information that over 500 students were at the entrance into campus waiting to kill him. It was then that the students, refused signing the deal outright. The students leaders said that for any talks to start, they want the unconditional release of their leaders, Abia David. It is worth noting that during the meeting, UBSU spokesman Donatus Wanobi displayed four live bullet shells purportedly used to kill him by forces of law and order in his hideout in Molyko. The roof of the house where he was hiding reportedly had bullet holes. The UBSU spokesman told the committee that a number of girls in the university residential area have been raped by forces of law and order. A form two student of GHS Bokwango is reported to have been a victim. While the meeting was going on, Vice Chancellor Professor Lambi stormed in to the hall with a communiqué from the Minister of Higher Education, Jacques fame Ndongo stating that the number of students to be admitted in to the school of medicine has been raise from 60 to 85. The student said they were grateful for the increase but. This however, failed to cause the students to go back on their decision not to sign the truce. Meanwhile a release from UBSU which preceded the meeting stated in lucid terms that they will not in any way allow orals to hold today. It said if the university goes ahead to hold the orals, they will consider that the university has dismissed all the 12.000 students and admitted 85 medical students. He Spokesman of UBSU Donatus Wanobi told the press that he is not certain if his detained mates are still alive given the fact that his own live has been under constant threat from forces of law an order. During the meeting the Director of Student Affairs, Ludwig Metuge called on the powers that be to avoid further harassment of students by coming out with a solution. UB registrar, Dr. Victor Julius Ngoh on his part said the Head of State has said all must go well and has guaranteed the security of the students. He told the students that they should appreciate the fact that 7 points in their memo have been accepted with the remaining 2 being beyond their competence. He added that university administration is powerless to push the investigation in to those who murdered students. Dr. Johnny Fonyam President of the Higher Education Teachers Syndicate, SYNAES, told the students not to always allow their strike actions to lead to the point where students are killed. By press time, UBSU had not said whether they will interrupt the orals if they are still scheduled for today. The South West Regional Secretary for Human Rights and freedom, Tambe Tiku told the press that he has made several attempts to see the detained students to no avail. Paramilitary forces invaded the university campus as early as 6 am. Their goal is to force students and the UB authorities to conduct the now infamous orals. Students had been striking for the reinstatement of the initial list of 127 names, which was a transparent reflection of passes in the entrance examination. Government, in the middle of its fight against corruption, decided to corrupt the list. As I write report, the atmosphere in UB is very tense. Some jury members who have elected for anonymity have decided to stay away from this mass corruption and mano militario hijacking of excellence. They say in such an atmosphere, the chances are that students will be operating under duress. The fear is that the humble intelligent students who had passed in the first place would cower to give their places to the francophones who are groomed in corruption and fraud. If Paul Biya and its allies think they can achieve their overall goal of torture and intimidation, of an entire oppressed and marginalised population, by brutally killing mere striking students without lethal weapons, demanding for non-political accountability for decisions affecting them, then surely there is a hidden agenda, as Prof.Lambi rightly puts it, although he has not yet landed. I am sure he would soon land. I do not see the death of those students this time around easily forgotten. ALL ANGLOPHONES, SOUTHERN CAMEROONS AT HOME AND ABROAD, UB STUDENTS’ UNION AND UB GENERAL STUDENT BODY. We already have the facts at hand. The exam was organized and supervised by the GCE Board. The scripts were corrected using computer technology. A little over 800 students sat for the exam. 60 students slots were available in the Medical Faculty. The first FROG came in the 600th position on the written part of the entrance exam. 127 applicants all of Southern CamerOOnian extraction thus meritoriously were selected for the oral examination. Fame Ndongo decided to add 26 FROGS who didn’t sit for the exam. UB students rejected this outright corruption and Lambi (theVC) accepted. Hell broke loose and 11 student lives were lost directly or indirectly. Fame Ndongo didn’t know what to do and decided to be speaking via Lambi. This is the reason why Lambi vomited rhetorically that the Minister’s list will be maintained. Fame Ndongo not knowing what else to do, decides to increase the slots from 60 to 84 to accommodate the FROGS who never sat for the exam. WE ALL KNOW THAT UNTIL THE NUMBER OF SLOTS IS INCREASED FROM 60 TO 6OO CAN ANY FROG FEATURE AMONG THE LIST OF THOSE TO BE ADMITTED i.e. IF THERE WERE TO BE NO ORALS. Drawing from the facts that we all know, UNDER NO CIRCUMSTANCE shall there be any FROG on the list of students admitted into the UB Medical Faculty at least for this year. LET EVERYONE BE ON THE WATCHOUT WHEN THE FINAL LIST IS PUBLISHED. If you notice any FROGS at lectures deliver them to the public to be stoned to death. For they are the reason for their parents to be doing what they are doing to the detriment of the unfortunate you and I.
I have never know academics could sell themselves so cheap. Cameroon is for Cameroonians from north, South, West and East. Nothing will stop it. I say nothing. I am wondering if that is form of Affirmative Action in Cameroon. If yes, does that apply in all Universities in Cameroon? Can someone enlighten me on that. Riccardo, join me to say there is no need for orals as others have stated. The 60 positions available should go to the TOP 60 passes now and in the future. If there are say 5 applicants with the same marks between the 58 and 62 positions, these candidates should attend a ceremony and draw a lottery. Alternatively, all 5 should be taken. The first Francophone pass came in the 600th position. This is a direct result of the weak Francophone System of Education - a disservice to development. Minister Fame Ndongo has manifested the worst form of intellectual corruption and this can be related to weaknesses in the educational system that brought him up. He should be fired. This is not affirmative action. It is hijacking by the powerful, amoral elite of la republique. If it were affirmative action, there would be no Ewondo names, nor Bami names (I guess there were no Bamis) on that list. It might have included names from the Northern Provinces of La Republique and perhaps the Eastern Province. Affirmative action serves a purpose, but the guidelines have to be agreed and set apriori and not after the fact. International students also have a place in any university that wants to become great. A couple of spots for qualified Nigerian students or Ghanaians or Americans would not be a bad thing. Those places, particularly Nigeria have been very generous in advancing educational opportunities to our people, inspite of the hostile relationship with la republique. Regional balance is crap. There are institutions whose doors have been closed to Southern Cameroonians for a long time, such as the Politechnique in Yaounde. Now they talk about regional balance because they want what we have for themselves, and will kill it in order to have it. Yes it can be done. Violators of Human Rights can be prosecuted in the United States. Please, see the attached story from BBC and circulate it as much as possible. Please, compile the names of police commissioners and legion commanders and DOs/Governors involved in the killing of SC'nians and send overseas to various human rights organizations. Keep watchdogs at the airports to track down the international travel of these criminals and once one of them located overseas, prosecuted for crimes against humanity and thrown in jail, the rest will adjust. Amadou Ali is fund of traveling to Switzerland. That will be a good place to file a lawsuit against him so that when he shows up there, he is arrested and put on trial. Please, it can work. The killings at UB are more gruesome that what was done by Charles Taylor's son. We need action immediately. Strike the iron while it is hot. The son of former Liberian President Charles Taylor has been charged in the US with committing torture. The indictment against Charles McArthur Emmanuel, known as Charles "Chuckie" Taylor is the first time a 12-year-old federal anti-torture law has been used. The US was able to charge him because he was born there. He is alleged to have committed the offence in Liberia while his father was in power. Charles Taylor is in The Hague awaiting trial for war crimes in Sierra Leone. He has been accused of backing rebels in the decade-long civil war in Liberia's neighbour. The former president went into exile in 2003 in a deal ending Liberia's civil war. Chuckie Taylor had been arrested in late March in Miami and has pleaded guilty to passport fraud. He was in charge of presidential security when his father was in power in Liberia, and is accused of taking part in the torture of a victim in July 2002. "The allegations in this case include acts of torture, such as burning flesh with a hot iron, burning flesh with scalding water, and applying electric shocks," a US attorney said in the statement. The assistant secretary for immigration and customs enforcement said it was a "clear message the US would not be a safe haven for human rights violators". Thanks Tekum Mbeng and Ma Mary, I am still educating myself on this issue. It makes no sense. If Cameroonians want to attend other Institutions, they have to be up to the standard. Please, make no mistake, there is or shall never be any Institution in Cameroon reserved to english or french speakers. Those who claim UB to be ours are daydreaming!!! UB IS CAMEROONIAN, PERIOD. It is a shame to see us fight, using the language of the colonizer as our difference! Let us be clear. A competitive exam was written needing 60 Cameroonians to be trained as top medical doctors. Why should Higher Education Minister Fame Ndongo or anyone for that matter add candidates below the 600th position and some that did not write the said exam to the admission list? Fame Ndongo is promoting intellectual dishonesty in the ministry of higher education. A rotten head destroys the body. Riccardo, which surgeon would you like to meet in a theatre? Is it the man/woman who was "helped" into medical school or the man/woman who came top? Be honest. This is a fundamental issue of values, ethics and unalloyed attachment to justice. Fame Ndongo failed because the system that brought him up is weak in critical dimensions. This is not good for Cameroon. The Francophone Educational System deserves basic reforms to raise standards across the board to catch up with the runaway and challenging Anglophone system. This is in the interest of Cameroon. We all remember the BAC de Ndam Njoya comprising transalated GCE A/L questions that Francophone high school leavers flunged en masse.